I have developed this love-hate relationship with the Beauty and the Beast fairytale as an adult. I want to read the original one day but in the meantime I’ve seen and read plenty of adaptations. I’m endlessly fascinated by it and so far the only adaptation I’ve enjoyed as an adult is Hunted by Meagan Spooner (and yes, I love the Disney version as a child). 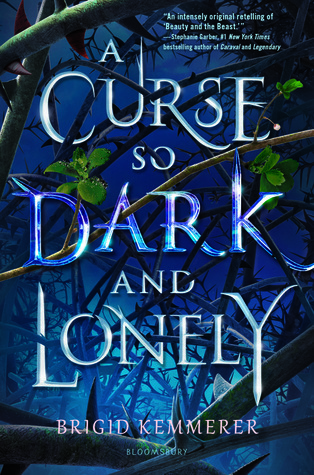 So when I began A Curse So Dark and Lonely, I didn’t know what to expect but I can say that fun is one word I didn’t think would come to mind. But it was so fun to read and unputdownable. Brigid Kemmerer’s version relies more heavily on the source material plus introduced a modern element that worked amazingly well. Prince Rhen is heir of Emberfall and cursed by a powerful enchantress to repeat the autumn of his 18th birthday over and over again until a girl falls in love with him. What seemed so easy to shake off at first now weighs heavily on his soul after years of turning into a vicious beast at the end of each season, one that’s killed his family and his people. Then Harper Lacy comes along. She’s from Washington, D.C. with a family that consists of an absentee father, fatally ill mother and an older brother doing his best to protect them. 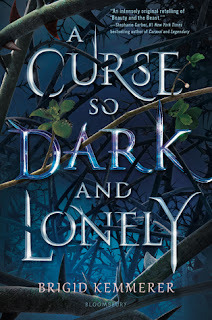 She’s a survivor and when she somehow gets sucked into Rhen’s cursed world, she doesn’t know what to do or what believe except follow her instincts and shockingly, getting to know Rhen and his kingdom. It was the juxtaposition between her “real world” know-how and his fantasy world princeliness that made this fun and more important, work. I never would’ve imagined a retelling like this and kudos to Gaughen for bringing it to life. What fairytale world would you want to portal into? : The first thought that came to mind was The Little Mermaid but without all the Ursula shenanigans. But I'd love to be able to swim and see King Triton's Castle, Ariel's Grotto and Prince Eric's castle. What I love about Kasie West books is how they are predictably cute, fun and engaging which make them perfect for when I'm in the mood for light reading. 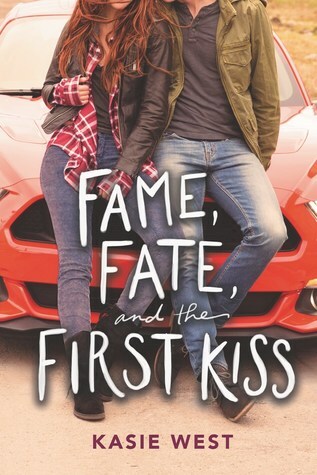 Fame, Fate and the First Kiss is about Lucy Barnes, an aspiring actress who's trying to finish her senior year of high school and film her first movie (about zombies!) alongside one of the current hot, young actors in Hollywood. It's her big break but she's struggling to learn the on-set ropes, deal with her protective dad, and work with her tutor Donovan who is a "nightmare" but I'm sure you can guess how her opinion soon changes. Lucy was a great protagonist to follow and she made me laugh out loud so many times. The most interesting parts of the story were watching her find ways to connect to the her character in the movie, make scenes come alive and how she finds inspiration to do so. It definitely led to some wacky moments but that's what made it fun. The romance was also really cute and the opposites-attract dynamic worked so well between Lucy and Donovan. It was easy to picture him being drawn to her quirks (without being a manicpixiegirl) and her to his solid, dependable nature. The book was shorter than I expected it to be so the story and plot is rather predictable and resolved quickly. But again, if you want something light and fun then that shouldn't be a problem! What's your favorite zombie movie? : Zombieland! Maybe it's because I regularly watch The Walking Dead which is so dark and depressing but I remember watching Zombieland and it was like a breath of fresh air. And this is coming from someone who doesn't even like Jesse Eisenberg! But Emma Stone and Woody Harrelson are great in it and it's just a fun movie.